Death Valley is one of the starkest landscapes in California, a geological wonderland of exposed rock and scarce vegetation. Travelers and adventurers have been drawn here since 1849, when would-be miners nearly lost their lives seeking a shortcut to the gold fields, giving the valley its name. If you've ever wanted to travel from Los Angeles to Death Valley or from anywhere in the world to this desolate land, we have just the guide for you. You can plan your Death Valley weekend getaway using the resources below. 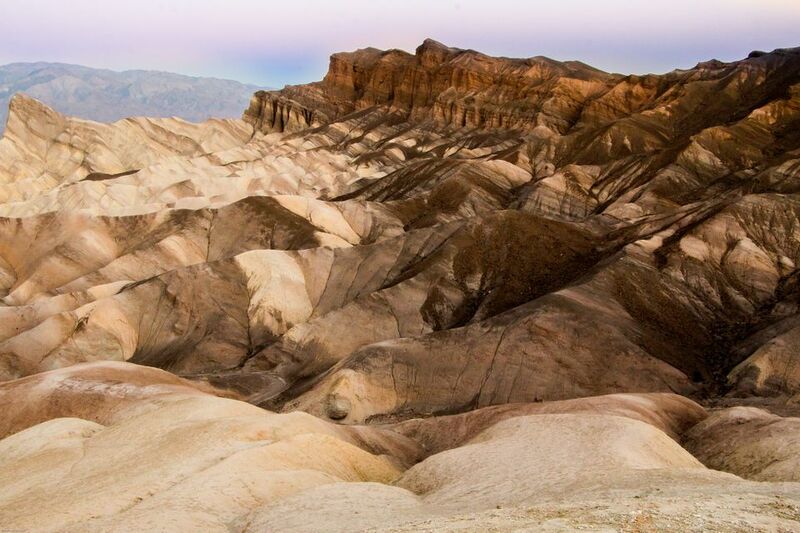 Death Valley is popular with hikers, photographers, stargazers, and those who love the Old West. The Inn at Death Valley (formerly The Furnace Creek Inn) is also a great place to relax, swim in the pool, and get a massage. Death Valley is a great destination for those looking to get away from the hustle and bustle of Los Angeles, San Diego, and other cities. Death Valley weather is best in December and January. If you go during November's Leonid meteor showers, especially if they occur during a dark moon, you'll get an extra nighttime light show. During summer, the valley is blazing hot and the Inn at Death Valley is closed. If you only have time to do one thing in Death Valley, California, take the 18-mile drive south on CA Hwy 178 from Furnace Creek to Badwater. It's part of the Death Valley photo tour. Sunrise is worth getting up early for, and sunset from the Death Valley Inn is just as lovely. With the nearest city far away and little stray light, night skies are outstanding, whether you just sit and watch or bring a telescope. Rhyolite Ghost Town is unique in its architecture, which included several buildings made of concrete. That means it has more standing ruins than almost any other ghost town in the southwest. It also has an interesting outdoor sculpture exhibit. Badwater Ultramarathon: Held in July, this grueling race goes from Badwater (282 feet below sea level) to the flanks of Mt. Whitney at 8,360 feet, taking the winner more than a full day to finish. Not wanting to be left out, bicyclists test their mettle against the desert in the Silver State 508 (which is also called the Furnace Creek 508), a 508-mile bicycle race held in September. The Death Valley 49ers Encampment happens here in early November, and accommodations fill up fast. Las Vegas Astronomical Society holds an annual Star Party in late January or early February at the Furnace Creek airport. With dark skies, this is a good place to watch a meteor shower. The most impressive are the Perseids, which happen in August and the Leonids in November, but there are more. Stardate has a full calendar of them. Get an early start if you want to go hiking here, even in mid-winter. Bring plenty of water. You'll drink more than you can imagine. Bring your binoculars to see wildlife and get a closer look at some of the geology. At night, a good pair may also be helpful for stargazing. To cope with the dry climate, buy the right gear before you go to the desert or mountains. The Oasis Resort at Death Valley offers a casual cafe, an old-fashioned steakhouse and there's an upscale restaurant at the Inn at Death Valley. Down at Stovepipe Wells, the atmosphere (and the food) is more casual but good. There are plenty of Death Valley hotels and Death Valley camping sites to choose from. The Furnace Creek Inn is a popular place to stay. Death Valley is 290 miles from Los Angeles, 350 miles from San Diego, 445 miles from Sacramento, 488 miles from San Jose, and 141 miles from Las Vegas. Research your travel route carefully before you go in order to avoid common pitfalls. The nearest airport is in Las Vegas.